Long life and low maintenance polyurethane wheels are ideal for heavy duty applications. The core contributes to the wheel's high impact strength. Precision molded thread is mechanically interlocked to a ribbed poly core. Polyurethane tread bonded to heavy duty steel core. Used for extreme weight loads and high impacts. Wheel includes cage roller bearing. 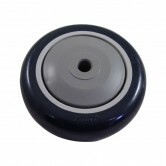 Designed for heavy duty applications..
Rubber tread boned to steel core. Ideal for all rolling surfaces. Wheel includes bearing. Heavy duty rubber tread design provides maximum floor protection and quiet operation. Ideal for all rolling surfaces. Molded macerated fabric with phenolic resin plastic. Design provides maximum floor protection and quiet operation. The core contributes to the wheels high impact strength. Solid poly design. Injection molded of durable thermo-plastics. Wheels withstand high impacts and offer resistance to most chemicals, solvents, oils, grease and acids. Wheels are molded of high standard non-marking rubber compounds. Rubber wheels are shock absorbent and are recommended for normal loads where noise is a factor. Solid rubber tire on a steel wheel. WHEEL, POLYOLEFIN 5" x 1-1/4" x 3/8"
5" x 1-1/4" x 3/8"
WHEEL, POLYURETHANE, 1-1/4 TD, 5"
Commonly used on shopping carts.